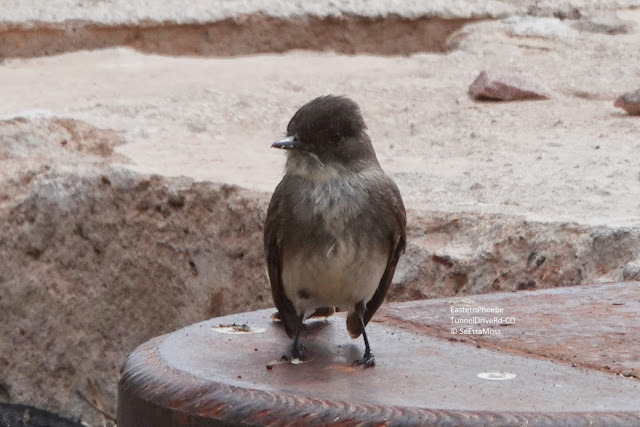 I found 2 Eastern Phoebes along Tunnel Drive Rd on the far west side of Canon City last week. Eastern Phoebes breed in the Canon City area every year though they usually migrate out during the winter. Last year I was able to follow a pair of Eastern Phoebes that nested on the other side of the Arkansas River. Here is the female on the nest. 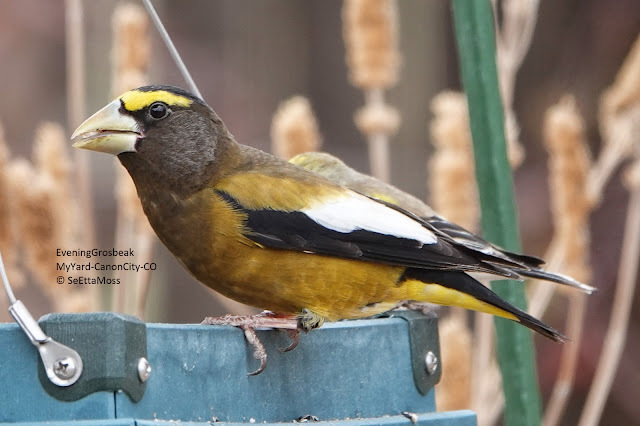 Like most bird species the male Evening Grosbeak are much more colorful than the females. Their gold overall plumage and large size make them stand out. Birds of North America online notes, "Irruptions often include other fringillids, such as Pine Siskin (Carduelis pinus)...." And interestingly the other bird in the pic above is a Pine Siskin, one of a number that have come in at the same time as the Evening Grosbeaks. They most often seen in flocks and so they can empty feeders quickly. An 'irruptive' species, they wander in search of food resources (for the whole flock, not just feeders in one yard) showing up irregularly.